Hey Byte Knight, are there going to be any Ultimate Flashbacks for sale at PRGE? Possibly - I've had so many orders lately that I haven't had time to modify my own FB's that I was going to bring to PRGE. But, I'm working with Hafner Enterprises to create a controller PCB with built-in DB9 ports that will mount directly to the FB PCB mounts. This should cut the time of the upgrade process down significantly since I'll have way less tiny wires to solder! Found it. It was in etc/emulationstation/es_systems.cfg. Okay. And that means you have the newer setup of retropie. Its likely not in there but you can doublecheck its contents for the jzintv command script. The script that launches jzintv has to be somewhere. I was expecting it here. keep me in the loop on that. 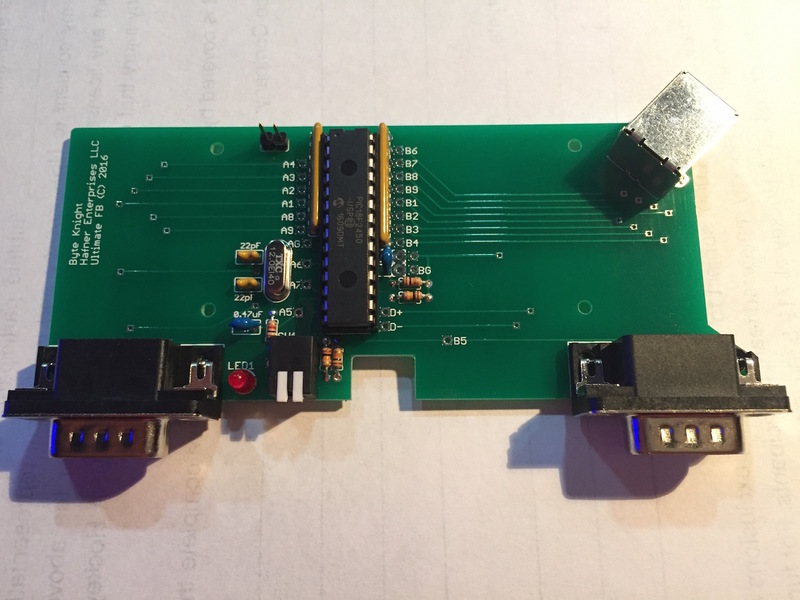 I dont need one for my intv pi but i will mod my coleco if i can get a board. Edited by pimpmaul69, Tue Sep 6, 2016 6:36 PM. I found the resolution setting in that file when I found the file. It launches jzintv in 4:3 now. My TV upscales just fine when I choose -z1. Silly question, but is there any reason to choose any other 4:3 setting? I'm thinking that either at 800x600 or 1024x768, the retropi is upscaling to that, and my TV does the rest. So at either setting, I'd see the exact same thing, with no improvement either way. Does that make sense? Thats something i wonder about. I would have thought using the native resolutin of the display is best (1080p or 768p depending on the display). Modern TVs must be designed to process 480p and 720p well. I'm no expert but i would think less processing is needed at native resolution. Question, sorry if it's been asked, I have been searching for the answer... what's the power down sequence for this Ultimate setup, does it by some means run the proper "shutdown" command on the Pi before cutting the power? Like any computer you're suppose to do a proper 'system shutdown' before cutting power. So first exit the game then bring up the 'main menu' (try 'enter' on the controller keypad); then 'quit' and 'shutdown system', then cut power. You can also add a circuit that does this with a switch (eg. http://mausberry-cir...your-own-switch). What's the risk of cutting power without a system shutdown? Perfect, thanks. I figured there would be, but I couldn't find it.. cutting power to a computer (which the Raspberry Pi is) without letting it do it's proper shutdown can corrupt files, screw up any process that was running. It's better to be safe than sorry. Actually I have a Pi with Emulation Station on it, and until you mentioned this I didn't realize the machine could be shut down from within the GUI. I've been exiting to the terminal to run "sudo shutdown" when finished. I'm not using Intv controllers on it, but you still access the same main menu. Ha. Check this prototype out - plug and play for your Flashback (well, almost)! I had Tom design me a version of the Ultimate PC Interface that has the DB-9 jacks built-in and attaches to the existing PCB mounts. Much less soldering of tiny wires! Let me know if you're interested in one - I'm planning on doing a main run for my FB upgrade service shortly. I'm hoping somebody can help me get Intellivision running on my new Raspberry Pi 3/retropie system. I'm new to this and as I understand it I need to install jzintv separately in retropie. Here's the thing - I want to use the Vision-daptor or maybe the Ultimate PC Interface with the flashback controller. From what I understand, retropie/jzintv won't map the keypad buttons properly and thus the controller won't work unless I use a hackfile. That's where I'm lost. I have no idea which hackfile to download and use or if I need to manually make changes to it before copying it over to jzintv. But I'm new to retropie and I will be installing the latest retropie image from the official site which is currently 4.1. I'm guessing it's not a good idea to overwrite the new files in the 4.1 retropie image with older files in that intellivision.us 3.2.1 download, am I right? That seems like steps I don't need to do if I just install jzintv manually through the retropie menus. So how do I get things up and running for Intellivision? Do I just manually install jzintv through retropie's menu and then copy a hackfile over to the jzintv folder, or do I need to change a bunch of cfg files first to get it to use the flashback controller properly? 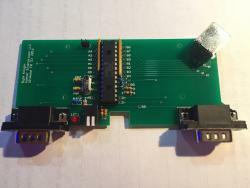 I thought it would be as simple as plugging the flashback controller into the Vision-daptor or Ultimate PC Interface and it would just work as expected but it seems more complicated than that. Can somebody throw me a .cfgfile that is already set up for the new retropie 4.1 and the Vision-daptor/Ultimate PC Interface for the flashback controller? Sorry for the questions but I'd really love to get Intellivision running on retropie as it's one of my favorite vintage systems. I know I need to provide roms and stuff but my concern is getting jzintv set up and seeing the flashback controller. I'm assuming the newest 4.1 retropie doesn't have jzintv installed by default? Am I right that it should be in a list of optional installations in a retropie menu? Edited by fiudr, Sat Dec 10, 2016 2:10 AM. Unless something has changed Retropie does include jzintv for intellivision emulaion. It is incomplete without exec.bin and grom.bin. 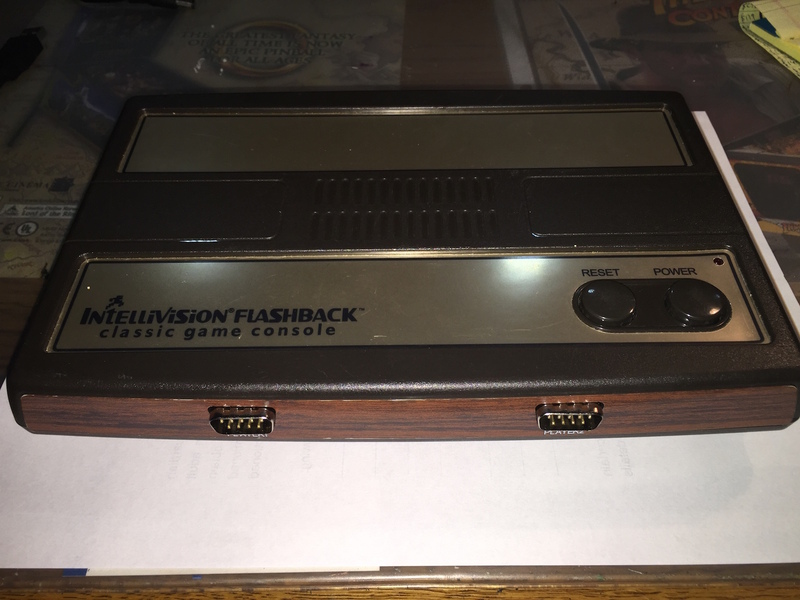 See the official instructions here https://github.com/R...i/Intellivision. It may not be the latest jzintv, which fixes a bug with ms pacman. With roms added everything should work except the keypad. Let us know if any of the file locations below has changed. The Retropie script that launches jzIntv can be found here. jzintv="/opt/retropie/emulators/jzintv/bin/jzintv -p /home/pi/RetroPie/BIOS -q -z1 -f1 -v1 --kbdhackfile=/home/pi/RetroPie/roms/intellivision/kbdhackfile.kbd %ROM%"
jzintv_ecs="/opt/retropie/emulators/jzintv/bin/jzintv -p /home/pi/RetroPie/BIOS -q -z1 -f1 -v1 -s1 -m2 --kbdhackfile=/home/pi/RetroPie/roms/intellivision/kbdhackfile.kbd %ROM%"
The keyboard hackfile is the same for both the visionadaptor and the ultimate interface. Both start the keypad at the ninth button. Make sure it has commands for quit and reset. Edited by mr_me, Sat Dec 10, 2016 7:21 AM. So do I just copy the hackfile.cfg as is from http://intellivision.../interface.php? and if need to add those strings at the bottom of your post, where in the hackfile do I add them? 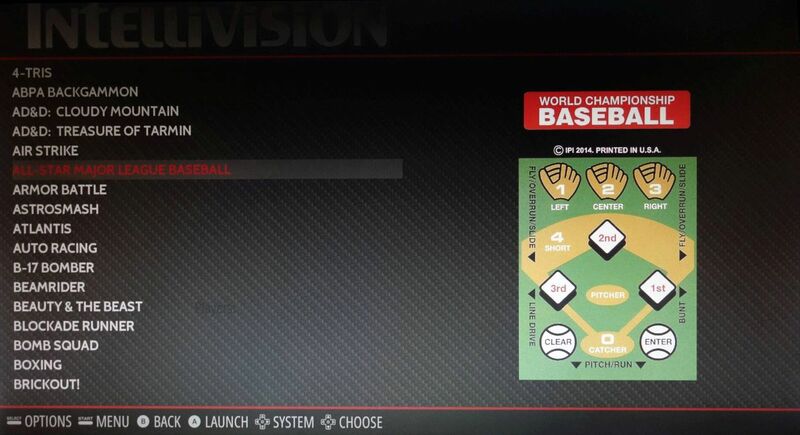 if you go to intellivision.us and in the options on the left side go to ultimate console. On that page download the zip file for retropie 3.5. If jzintv on your raspberry pi doesnt have the exec.bin, grom.bin, ivoice.bin and ecs.bin in /opt/retropie/emulators/jzintv/rom/ then add the entire rom folder and give 777 permission to all of those files. Add the the hackfile and jzintv file while you are in the jzintv folder. Give 777 permissions to that hackfile but not the jzintv file. That hackfile is already set up for the usb adapters you want to use. Thanks. Only thing is, I want to use the newest retropie (4.1) from the official site. How does the 3.5 zip file affect those newer 4.1 files? Is it safe to overwrite the 4.1 files with the 3.5 files in the zip, or is that a bad idea? I'd hate to mess up a brand new installation of retropie. Is there some new stuff in the 4.1 files that might get overwritten by older copies? Not sure what version of jzintv Retropie comes with, the one at intellivision.us might be newer. If you update it make sure it has executable permissions. The rom files (.bin .itv .int) have never changed. Not sure about the other files in that zip. If your adding any button mappings to the keyboard hackfile, put them anywhere in the 'map 0' section. Jzintv can switch between different button mappings with f5/f6/f7 and map 0 is the default. Edited by mr_me, Sat Dec 10, 2016 11:27 AM. I am curious about this as well. The hack files were last updated for 3.2.1. Has anybody used them on the newest 4.1 retropie? I am getting ready to make a couple of these for Christmas gifts. I plan to buy (4) ULTIMATE PC INTERFACES for myself: 2 loose ones to use on my desktop and laptop PCs, and 2 for my version of the ULTIMATE INTV FLASHBACK machine by RT12 PRODUCTIONS. I do plan to use a Raspberry Pi 3+ unit with either a hard drive or a solid-state data drive; do any of you have any experiences using a solid-state data drive?!?! Plans are to put the controller and accessory ports up front. What kind of external keyboard (and printer) would you recommend to use with my ULTIMATE INTV FLASHBACK?!?! The machine will have an LED indicator light, and modern audio/video hookups. What kind of A/V connection(s) would you recommend–RCA (Y/W/R), RGB comp, or HDMI?!?! operating on Emulation Station, with RetroPie and jzINTV and other emulators. What kind of A/V connection(s) would you recommendRCA (Y/W/R), RGB comp, or HDMI?!?! HDMI is the way to go. I'd get a Bluetooth keyboard and pair it to the Pi3. Not sure why you would need a printer. The FB's already have an LED power light. For your flashbacks, you might want to go with the Ultimate FB Interface, which is the Flashback plug and play version of the Ultimate PC Interface. 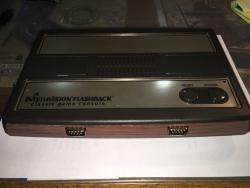 I plan to use an actual outer shell (top and bottom) from an actual old Intellivision console, albeit without any of its original innards, and resume afresh from there. I’ll also need to build an LED indicator light in there. OK, it had to be done. I loaded up retropie 4.1 on a pi2 I had lying around to see what's new on 4.1. You know you were all wondering. I'm using the INTV flashback controllers with 2 vision-dapters. jzintv is included in the build, but I couldn't get the included jzintv to run MsPacman, so I replaced it with a copy of jzintv that Byte Knight sent me, changed the permissions of jzintv to 0755, and then it worked perfectly. 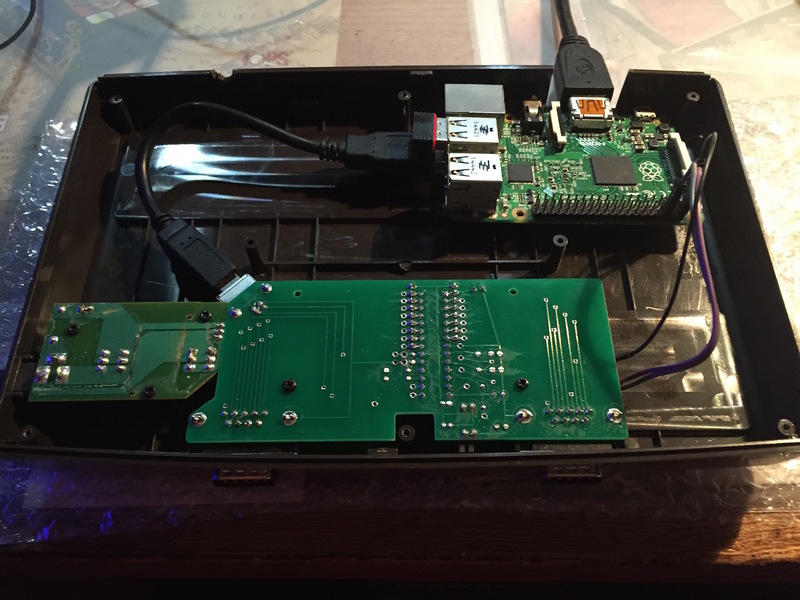 jzintv = "/opt/retropie/emulators/jzintv/bin/jzintv -p /home/pi/RetroPie/BIOS --kbdhackfile=/opt/retropie/emulators/jzintv/hackfile.cfg -z1366x768,16 %ROM%" default = "jzintv"
Just make sure you put them above the #include..... line. Pick another shader if you don't like "crt-pi.glslp"
And on that note, I just wanted to thank everyone at this forum for all the help I've been graciously given the last two years as I've built about 5 of these things for nephews, nieces and friends, and gotten the software up and running from versions 2.1 on up to the current 4.1. In particular, intvdave, Byte Knight, mthompson and mckafka99 - you guys have all been hugely helpful and generous with your time and advice and it's greatly appreciated. It's a really helpful community that's been a necessity when dealing with this fun/frustrating project! Many thanks to everyone! Edited by paulace50, Mon Dec 19, 2016 9:00 PM.